It has been passed 50 years since that historic period known as the ’60s and that represented in America the beginning of a new era. From 1967 to 1969, something happened that changed the destiny of an entire generation, the “flower children” one. Young people responded to the war with their “flower power”, a new counterculture focused not only on political but also on the ideals of love, spirituality, drugs and a new musical genre, the Psychedelia and that culminated in the summer of ‘ 67. At age 50 from what was called “Summer of Love“, also the fashion world responds with capsules and themed advertising campaigns, based on colours and themes load of optimism. In view of the new Spring/ Summer season 2017, there are many famous brands that have resulted in missed collections with clear references to the 60s in San Francisco. Wrangler is one of fashion brands that has answered the call by giving his contribution to the Summer of Love celebration. Thanks to Peter Max Graphic contribution for the summer coming we face a typical psychedelic prints of those years. A special occasion for the famous denim brand as well as wanting to celebrate the legendary 60’s in 2017 also will celebrate the first 70 years of operation, creation and success. Among the other fashion brands that plan to show off their hippie side, even Levi’s, that offers the most emblematic pieces of Orange Tab. The successful collection created in those years, is now revived in a modern key that can be found above all in t-shirts. 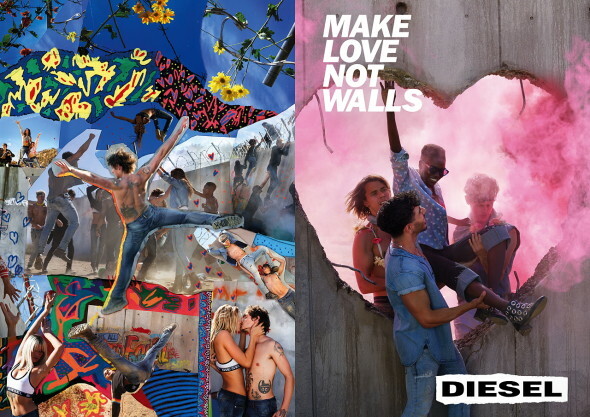 Diesel completes the 60s Summer of Love celebrations, with a special storytelling focus on themed images created by the artist David LaChapelle.